Students celebrating the festival of Holi at Visva Bharati in Santiniketan – the university set up by the poet Rabindranath Tagore in India. Should a university provide a moral or spiritual education to its students? The idea seems ridiculous in the age of the mega-university. Universities today are enormous corporations, employing tens of thousands of academics and staff, with anything from 5000 to 30000 undergraduates studying there at any one time. The university is a microcosm of our multi-cultural society – there can be no one over-riding ethos in the ‘multi-university’. Yet, while few believe universities should teach values, it’s increasingly accepted that they have an obligation to support students’ emotional well-being. Indeed, students now demand better counselling services in return for their tuition fees – demand for student counselling has gone up 50% in the last five years. There’s no sense that students’ emotions might be connected to their values, or that the so-called ‘well-being crisis’ on our campuses is in any sense a crisis of values. But I think that’s what it is. And it’s a microcosm of a wider crisis of values and meaning in our society. It’s worth remembering that, for most of universities’ existence in the West, they had an explicitly Christian mission to shape the values of their students. ‘Wisdom’s special workshop’ was how Pope Gregory IX described universities in the early 13th century. The life of a student was, until the late 19th century, morally regulated – there was compulsory chapel, time given over each day for prayer and scripture, and a fairly strict moral code students were expected to adhere to. And it was quite easy for the university to act ‘in loco parentis’, because, until the 20th century, there would only be a few hundred students in a university at any one time. In the mid-19th century, German universities began to develop the research-based university that we know today, with highly-trained specialists working on their particular area of research through departments, seminars and post-graduate doctorates. There was less of an emphasis on Christian dogma, and more on a commitment to scientific truth. But there was still a Romantic emphasis on ‘bildung’, or character-formation. As the German philosopher Johann Gottlieb Fichte rhapsodized in 1810: ‘The University is the institution…where each generation hands on its highest intellectual education to succeeding generations…[so that] the divine may appear in the human in fresh clearness’. Through the influence of German academia, American and British universities became less explicitly Christian in the 19th century, but they retained the liberal Protestant idea that universities should try to develop virtuous citizens. This would take place not necessarily through prayer and theology, but rather through courses in moral philosophy or Great Books. There was a liberal faith that universities’ two principle aims – the pursuit of scientific truth and the development of good character – were in harmony, not conflict. After the First World War, faith in both Christianity and scientific humanism took a battering. There was no longer an optimism that scientific progress necessarily led to moral progress or Christian faith. So to which of these did academics owe their allegiance? The sociologist Max Weber, in a lecture of 1919 on ‘science as a vocation’, insisted that the proper allegiance of academia is to science, not religion or morality. He told undergraduates: ‘It is not the gift of grace of seers and prophets dispensing sacred values and revelations, nor does it partake of the contemplation of sages and philosophers about the meaning of the universe’. The good academic, says Weber, should never impose their own view-point, ethical, religious or political, from the lectern. They should not be ‘petty prophets of the lecture-room’. They should not even try to be moral leaders. Instead, academic research and teaching should be utterly value-free, except for the supreme values of scientific rigour and intellectual integrity. Scientific research won’t necessarily improve general well-being – who thinks science leads to happiness apart from ‘big children in university chairs’? – but it will contribute to the great work of our time, namely the rationalization and disenchantment of modern society. Here one notices a glaring inconsistency in Weber’s lecture, or should I say sermon. After insisting that academics should never impose their own moral view-point from the lectern, that is precisely what he does. The ‘fate of our times’ is disenchantment, he says, and those ‘who cannot bare the fate of our times’ should collapse ‘silently’ into ‘the arms of the old churches’ and leave the battlefield to the brave, like him. In other words, the culture of modern academia is not really neutral and value-free. On the contrary, it is explicitly disenchanted, naturalist, positivist, materialist, and, in fact, atheist – the perspective of faith or religious experience is denigrated or excluded. In the 20th century, universities went from being explicitly Christian institutions to being cultures in which there was an established culture of non-belief. Academics are far more likely to be atheist than the general public (see this, on faith among scientists). As the historian George Marsden has argued – perspectives of religious faith or religious experience are now largely excluded from the positivist culture of academic discourse. The 19th hegemony of Protestant rational religion in academia has turned into the contemporary hegemony of positivism. But something of the old moral mission still exists in American universities, particularly in the form of freshman courses in the ‘science of happiness’ or Positive Psychology. There are freshman courses in the science of happiness at Harvard (where it’s the most popular course in the history of the university); at Rutgers; at Berkeley; at NYU and elsewhere. Anthony Seldon, the new vice-chancellor of the University of Buckingham, has even launched a new plan to make Positive Psychology classes compulsory for all students, as part of a whole-university initiative called ‘the positive university’. I really applaud these sorts of courses in Positive Psychology, but they’re not perfect. They tend to be quite scientistic – they insist that empirical evidence is sufficient for moral formation, that you can measure everything important, from happiness to meaning, and anything you can’t measure (like, say, closeness to God) can be safely ignored. Positive Psychology also often ignores the role of ethics and debate, for example around such questions as ‘when is flow bad for you?’ or ‘what meanings in life are good meanings?’ and so on. For example, I’ve just read U Thrive: How To Succeed in College (and Life), a new book by Daniel Lerner and Alan Schlechter, who teach a popular course on the science of happiness at NYU. It doesn’t mention ethics once! The closest it gets is talking about the dangers of ‘obsessive passion’ or ‘junk flow’. And it lacks self-criticism – the authors never question their own perspective, they just relentlessly hype it, which is quite typical of Positive Psychology’s boosterism. It feels spiritually thin – the book is about thriving in life, but doesn’t mention death, or God, or politics. Far from inspiriing difficult life-questions, the book closes them down with pat answers. Another approach to wisdom in higher education is through mindfulness and ‘contemplative studies‘.There are contemplative studies centres at several universities in the US and elsewhere, and mindfulness centres at the majority of American medical colleges. Like Positive Psychology, contemplative studies balances research and practice, encouraging students to try out the methods it teaches for well-being. Like Positive Psychology, it incorporates first-person subjective perspectives (how does it feel, what is it like?). But like Positive Psychology, contemplative science can sometimes be rather scientistic, instrumental and lacking in ethical reflection. They also tend to focus exclusively on secular Buddhist contemplation, ignoring other rich traditions. 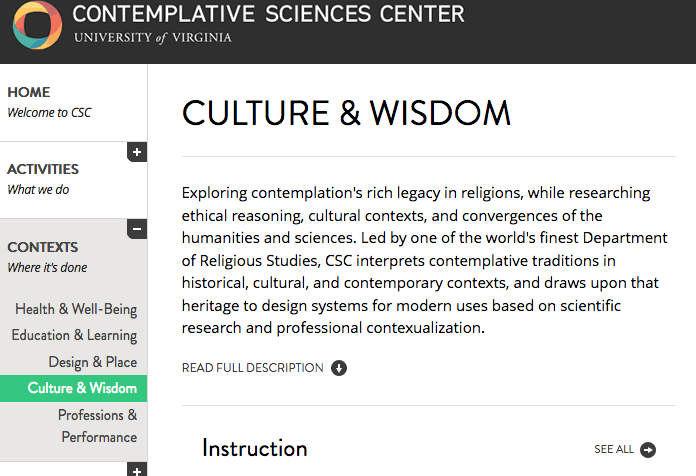 However, the better contemplative studies centres – Brown, Virginia – are genuinely interdisciplinary and include perspectives from the humanities. There are also universities trying to explore and promote the practice of wisdom from the perspective of the humanities, particularly philosophy. There is the ‘centre for practical wisdom’ at Chicago, which also has a famous Great Books programme; there are courses in Confucian wisdom and Aristotelian philosophy at Harvard; there is the Art of Living course at Stanford. There is also the ‘modern Stoicism’ project I’m involved with, which tries to marries theory and practice, science and humanities, empiricism and ethics. And then there are whole universities which take a more holistic approach to well-being and flourishing. There are Catholic universities in the US which still embrace a Thomistic or Aristotelian view that the goal of education is eudaimonia, or flourishing. General courses in philosophy and ethics are a standard part of the curricula in these institutions. There are also some graduate colleges dedicated to a spiritual view of education, such as Naropa College in Colorado, or Schumacher College in Dartington, or Santiniketan University in Bengal. I think British universities should follow American colleges’ lead, and start to offer courses in wisdom and flourishing, which are open to any undergraduates who want to attend, and which are also videoed. I would like to see courses that combine the empirical science around happiness with more open humanistic ethical discussions around questions like ‘what do we mean by flourishing exactly?’ These courses shouldn’t be outsourced to boring and not-very-smart well-being coaches, they should involve the best and brightest academics in the university. Well-being and flourishing shouldn’t be something at the periphery of students’ learning journey – something you only think about if you break down. It should be at the heart of the learning journey. A modern course in wisdom would be eclectic – teaching not one moral philosophy but several. It could balance wisdom from ancient philosophies like Stoicism and Buddhism with research from psychotherapy or social science. It could encourage purposeful discussions in small groups, rather than simply drilling students in dogma. And it could encourage practice and self-experimentation – homework could be trying out a meditative technique for a few weeks, or trying to break a bad habit, or seeking out meaningful conversations, or volunteering for a local charity. Humanities academics tend to dislike any focus on well-being, let alone ‘wisdom’, because it sounds conservative or neo-liberal to them. But a good course in wisdom would have plenty of room for critiques of particular definitions of well-being – perhaps the Stoic definition of flourishing is too individualist? Perhaps the Marxist definition defers happiness to some idealized utopian future? In other words, a good course in wisdom would be genuinely pluralist, both politically and metaphysically. The challenge is not to sacrifice free critical inquiry to dogma. There’s always a risk that universities pursuing wisdom fall prey to what critics call ‘medievalism’ (what they really mean is ‘Catholicism’). They can end up quasi-religious madrasas, endlessly repeating received wisdom, rather than challenging it. If an entire university is built around Positive Psychology, or mindfulness, then what happens to academics and students who challenge that approach – are they thrown out as heretics? You always need room for rebellion, for dissent, for criticism. Universities can be committed to the goal of encouraging flourishing, while recognizing that the paths to flourishing are several, and rarely run straight. This entry was posted in Emotional Currents and tagged Higher Education, mental health, well-being, well-being classes, wellbeing, wellbeing in HE by Jules Evans. Bookmark the permalink.